1994. I leave secondary school not knowing what to do after. I did not find anything that I wanted to study, so I did not have much intention to continue with an education that could be a step-up for university. I decide to aim lower with a two-year ‘middle level’ education and just start to earn money to allow myself to buy the things I want and do my own studies. 2002 I meet my girlfriend who is about to finish to two university studies and has some time in the scholastic year left. I had heard of the “Hermetic chair” in Amsterdam which she indeed attended for a short while. 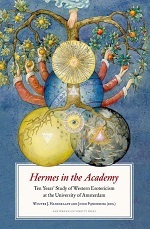 Hermes In The Academy, ten years’ study of Western Esotericism at the University of Amsterdam edited by main man Wouter J. Hanegraaff and one of his students Joyce Pijnenburg is the celebrating publication of that “Hermetic chair”. In this thin book (162 pages) you can read about the history of the chair (which was actually founded by a single woman! ), how it grew rapidly, early and current problems of the field of investigation, experiences of cooperators and student, world-wide connections and influences, the connection to the Bibliotheca Philosophica Hermetica (but mentioning nothing of the problems that were also there in 2009) and also some of the investigations that are performed there. It is a nice little book to read through to learn more about this black sheep in the global scholarly milieu. What would have come of me when this chair was there when I still had the choice to aim for university? Would I have went for it? Would I have had the skills for that level of education? A fact is that whatever is taught there, I have dealt with myself before the chair even existed, but certainly more scientifically sound. No need to ponder about all that too long. It is good to read how many students attend the chair for the “Geschiedenis van de Hermetische Filosofie en verwante stromingen; GHF” (“History of Hermetic Philosophy and Related Currents”) and how many new investigations are started. I might have to look for the publications that came from under its wings, but not everything published at univesities is easily accessible for people outside that milieu.